The true “Crown” chakra, Sahasrara or the “thousand petaled lotus” is located at the crown point at the very top of the head, or at a distance above the head. Its colour is Golden. The Crown chakra is usually described as being white (or shining white) in colour, although some describe it as more violet in hue. Some ancient sources refer the Crown chakra to be the Nirwana chakra due to some confusion. 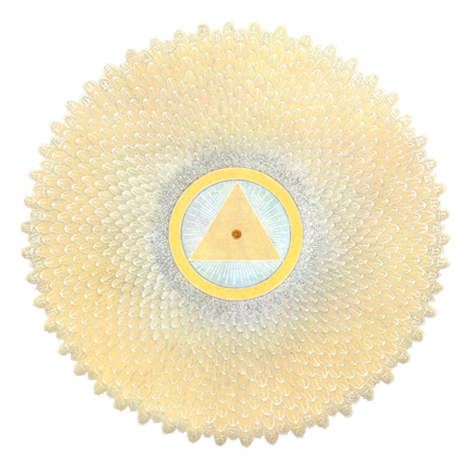 The Sahasrara chakra is somewhat above the Nirwana chakra is at the very top of the head (above the ears) and which is represented as having one hundred rather than one the Sahasraras traditional one thousand petals.